The 'Barred Numeral' cancel was used from 1856 to 1906 (if I'm informed correctly 2100 different types exist). These stamps exist with various perforations. This stamp has perforation 12. 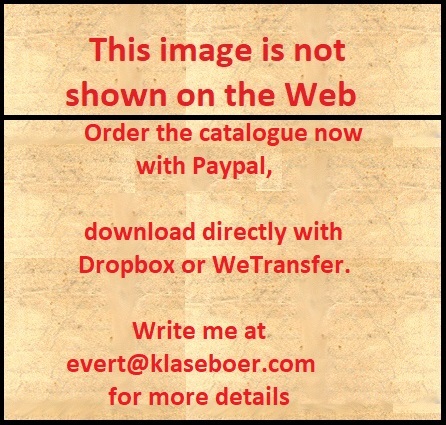 The value of the stamp should correspond with its watermark for the 'Single lined' and 'Double lined' watermarks, i.e. '2' for 2 p etc. 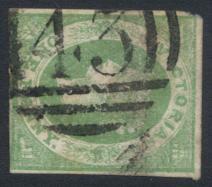 However, some stamps exist were printed on paper with the wrong watermark, for example the 2 p with watermark '1' etc. 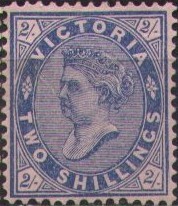 This stamp has perforation 12 1/2 and watermark 'V Crown'. 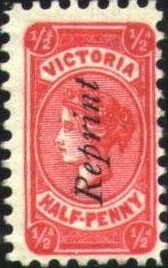 This stamp has watermark 'V Crown'. 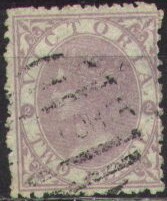 Two types exist of this stamp: with single external line of the oval or with double line. 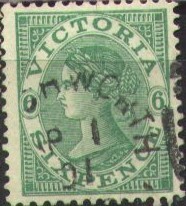 More stamps of Victoria click here.